Anette Lenz is a graphic designer of German origin, currently based in Paris. After studying visual communication and design in Munich, she moved to Paris in 1990, and established her studio “Atelier Anette Lenz” three years later. Much of her work has been created in France, beginning with her participation in the renowned design group Grapus, in which she collaborated with Alex Jordan to create socially conscious works of graphic design. Since then she has co-founded the design collective Nous Travaillons Ensemble, producing books, posters and identities for cultural institutions as well as cities. Théâtre de Rungis, one of 17 posters for the 2000-2001 season. Lenz’s knowledge of German typographic traditions combined with her bold French inspired imagery is a winning combination, and has brought her much success. Her client list is long and diverse, including names such as Hermès, Le Monde and Radio France. Among many designers, she has worked with Vincent Perrottet to create a series of large scale posters for the Théâtre d’Angoulême, for which they won the Silver Medal at the Tehran Biennale in 2004 as well as the Golden Bee 7 Grand Prix in 2006. Oleg Veklenko, part of the international jury for the Moscow Golden Bee Biennale for graphic design, describes Lenz as “shy, gentle and delicate… [yet] you would say the opposite about her works — daring, vivid, creative, and incredibly powerful,” (goldenbee.org). 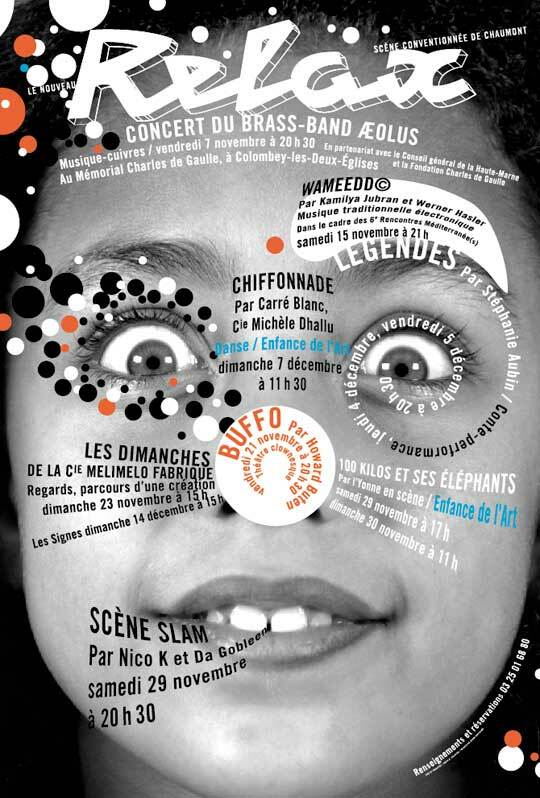 La tête dans les nuages, poster for children’s theatre festival, Théâtre d’Angoulême, 2004. In collaboration with Vincent Perrottet. With her extensive body of work, Lenz has exhibited in various locations, including Centre Georges Pompidou and the Bibliotheque Nationale in Paris, as well as participating in biennale competitions in countries such as Poland, Mexico and Finland, to name a few. Lenz also enjoys working with students of design, teaching master classes and workshops around the world, notably at the HEAD University of Art and Design in Geneva. Recently Lenz has been working on a project for Museé des Arts Décoratifs, designing pamphlets. In an interview with typofonderie.com, she reveals that she is using the typeface “Anisette”, created by Jean Francois Porchez, describing it as interesting and nicely designed, with “strong editorial originality.” Lenz explains that she didn’t want to simply create an information booklet, but rather a platform to showcase typographic design. Each booklet exhibits a different font, chosen with care based on its design and “personality”, and presents the designer of the typeface at the end. Lenz praises the creators of typefaces, something which she feels she would not be able to do.“For me, typography is an essential part of the global image I design,” she explains. “I use it often as a graphic element itself,” (typofonderie.com). Looking at the work of Anette Lenz, it is clear that typography does play a significant role in her dynamic designs. However the typography doesn’t strike the viewer as a prominent feature, but plays along with the other elements to create harmonious and effective pieces of graphic design. Program for the Musée des Arts Décoratifs, showcasing Anisette typeface. Motivated by the concept of poster design in public spaces, Lenz argues that, “in a world constantly moving, a poster ‘stops’, it creates a pause, a breath, it’s like a break from the world itself,” (typofonderie.com). At the end of her interview with Typofonderie, Lenz is asked, if she were a typeface, which one would she be? Her response is swift: Eureka by Peter Bilak. She has worked with this typeface through projects for Hermès as well as le Centre Chorégraphique, and admits, “I see a lot of myself in this typeface, it’s not perfect, but it has a lot of personality,” (typofonderie.com). Poster by Anette Lenz and Vincent Perrottet. “Anette Lenz.” Alliance Graphique Internationale. Accessed April 27, 2015. http://a-g-i.org/member-work/profile/281. “Anette Lenz.” Golden Bee Organization. Accessed April 27, 2015. http://www.goldenbee.org/9th/eng/jury/lenz/. Bossard, Nathalie. “Anette Lenz Et Vincent Perrottet.” L’Atelier De La Sardine. Accessed April 27, 2015. http://www.latelierdelasardine.fr/wordpress/graphisme-2/annette-lenz-et-vincent-perrottet. Wanner, Rene. “Web Poster Exhibition – A Theater Poster Series from Anette Lenz.” Rene Wanner’s Poster Page. Accessed April 27, 2015. http://www.posterpage.ch/winners/laht_03/lah1_03.htm. “Was Lange Wert, Wird Gut.” Neugier & Befruchtung. May 7, 2013. Accessed April 27, 2015. http://www.tgm-online.de/veranstaltung/was-lange-wert-wird-gut?id=300.